Here’s something profound. The reason most of us do not get referrals on a routine basis is because we do not ask for them on a routine basis. Well, it’s almost that simple. What would be the upside on your year-end bottom line if you asked for 2 referrals from each of your new customers? Let’s say you average 6 sales per month. That would be 12 referrals per month or 144 per year. Conservatively, you close half of those because they are warm referrals. Multiply 72 by your average revenue per sale. Then calculate your commission percentage off the total revenue sold. Now ask yourself if you can afford not to ask for referrals on a routine basis. Asking for a referral is one thing, but how many times do you actually get one? Execute a Powerful Routine after you acquire a new customer, and request permission for 3 additional minutes to get their professional feedback. Ask a series of questions soliciting their opinion on ways you can be more effective with your sales process, from initial contact to point of sale, with individuals in the same industry and parallel titles. You are now setting the stage for your future success. Over time, your contacts will give you a free ‘Masters Degree.’ Remember to ‘Pack your bags, but set the stage. Be honest and sincere in reference to the importance of referrals for running your business effectively. Tell your story. 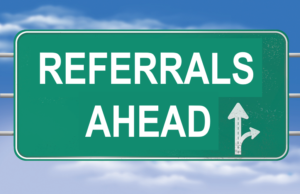 If you have a high referral ratio let them know that and why it is high. Customers respect a good businessperson more than a good salesperson. Try to pick a time when the contact would feel comfortable giving a referral to help your business. That may not be at the point of sale, but upon service implementation or some time in the future when you have proved you delivered what you promised. The important point is you must define with the contact when it can happen or what criteria need to be met for it to happen. Follow through in order to receive a consistently high ratio of referrals. You may not ask for a referral until (a) the service has been implemented and (b) the customer is satisfied. But as described in Tip #3, you want to minimally set a referral foundation at the point of sale and receive a commitment to when you’ll receive one. Now, this is very important. Always write in your day timer, planner or mobile device in front of the contact when the expectation is set, and let them know you are making note of it. Treat it like an appointment for your future success. It’s found business and will afford you a higher closing ratio, shorter sales cycle and most importantly, more referrals! So, follow-up and get it! Be creative. Give up some money or give some unique gifts. Maybe it’s a gift certificate to a local restaurant (hopefully a customer) or a graduated percent off of their next invoice. An entrepreneurial mind will come up with a few flexible programs that fit your level of buyer. After all, you’re not putting anything out until the referral is sold. The old saying, “money makes money” is still true. Beside the potential tax benefits (check with your accountant), contacts absolutely enjoy getting a little something. Measure the ROI and the benefit will be evident. Make it a system and follow the system. Be sure to give the referral gifts out promptly on sold referrals. Deliver it in person, since it also serves as an excellent time to prime the pump for additional referrals. Don’t underestimate the power of this simple discipline. I have experienced ‘millionaires’ who reopened their black books after receiving $20 dollar gift certificates. It’s probably one of the reasons they become a millionaire. After all, it’s not the amount but the gesture. And because you are spending your valuable time being the messenger, you will without a doubt focus on receiving one or two more warm leads. Offer local Chambers a deal they can not refuse. Chambers want to offer their membership a better deal, one that their members can not receive from regular street pricing. They are open to donations to help their chamber and are also motivated to grow their membership. Instead of offering a residual based off of sales, offer to bring them in a certain number of new members each month. After all, a certain percentage of businesses you call on will not be members, and if you can show them a return on their investment, they will certainly join the Chamber to receive it. By helping others you will see your referral ratio reach the sky! ‘Bird dogs’ are used by hunters to point and fetch game birds for their owners. In sales, a ‘bird dog’ is someone who has multiple relationships with your potential customers and they are motivated to routinely feed you contacts for your marketing efforts. Research potential business people that may fit into this profile, and take them out to lunch. Explain your referral program and how it could supplement their core business revenue stream. For potential ‘Big Hitters’ be prepared to customize your referral program to align with their motivations. Treat them like gold and they will open up their address book. There are companies that provide products or services in your ‘value chain’ but do not compete directly with your product or service. Those companies and the professional individuals that sell for them should be a point of concentration for you to identify and contact for strategies of collaboration. I refer to this relationship as “Natural Marriages.” Contact 3 sales professionals that seem to indicate a ‘natural marriage’ for you and them. Outline what’s in it for them. Then ask them what you could reasonably expect over time. Several people you know have the ear of your customers and prospects… partner with them. You have to eat lunch, right? So why not join or consider developing a Lead Group of entrepreneurial individuals who are motivated to get together twice a month or better yet, weekly to share referrals. Find individuals who are accountable to bringing in the minimum amount of leads each meeting as outlined in your group’s business rules. Make sure every member is covered by the 80-20 rule, getting 80% of their leads from 20% of the members. And don’t be shy about having to pay a membership fee. That way, members have some ‘skin’ in the game. I suggest BNI – Business Networks International because the system is created and it works.